Every department in Whitehall has nominated a minister responsible for ensuring devolution issues are taken into account when the UK Government makes decisions. The Secretary of State for Scotland wrote to the First Minister to inform him of the new devolution ministers network which will meet regularly under the chairmanship of the Deputy Prime Minister. 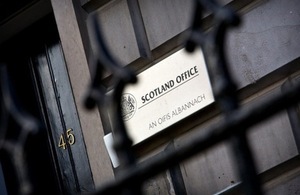 Its members will work closely with the Secretaries of State for Scotland, Wales and Northern Ireland. Speaking at the SCDI Annual Forum in St Andrews, the Scottish Secretary Michael Moore said the country’s two governments had to work closely together and that embedding the culture of devolution throughout the UK’s civil service structure would make for a better working relationship between Holyrood and Westminster. The coalition government made a clear commitment to a mutual respect agenda and the Scotland Office, other UK departments and their Ministers have actively engaged with their counterparts in Edinburgh. “We have made great progress in the relationship between the two governments in Scotland since coming to power. Our approach of mutual respect is the only basis for good working relations between Westminster and the devolved administrations. “While we have ensured, there are good lines of communication and consistent cross-border cooperation but we cannot be complacent. “I strongly support the new approach as devolution is fundamental to this government’s values and embedded in our national life. “Whatever the outcome of this May’s election, the UK government will seek to engage actively and constructively with the next Scottish Government.